We have two 4-star self-catering holiday cottages, available to book throughout the year. Jasmine Cottage and Rose Cottage are situated in the grounds of Hillyground Cottage, a Grade II-listed thatched cottage dating from the 15th century, in the pretty hamlet of Newton just outside the market town of Sturminster Newton. 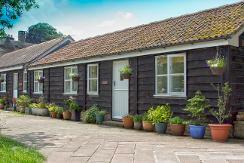 The cottages are surrounded by an acre of field and gardens, overlooking the River Stour and Newton Mill. Sturminster Newton is a medieval market town in the heart of the Blackmore Vale in north Dorset. It is 10 minutes’ walk or 3 minutes’ drive from the cottages. Shops include: butcher/deli, greengrocer, chemist, supermarket, newsagent, post office, doctors, dentists, vets, banks, takeaways, pubs and cafes. There is a local market every Monday morning. The Exchange, our community centre, has lots of events on, as well as a café/bar and exhibition space. Our nearest pub is The Bull, less than 5 minutes’ walk down the hill. Our location is ideal for walking, fishing, the Jurassic coast, pretty villages and market towns, historic houses and gardens, ancient hill forts and ruins, nature reserves, plus lots of family activities. We look forward to welcoming you to Newton for a wonderful holiday. 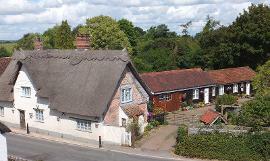 Inspected by Welcome Cottages to the standards of Visit England, England's offical tourist board.